2017 has seen more than its’ share of tragedy. Mother Nature was angry this year – very, very, very angry. Our world experienced multiple devastating earthquakes, hurricanes that tore apart whole islands and deadly fires that also ravaged homes and businesses. Then there was the broken hearts caused by recent acts of violence and rage – Las Vegas, Barcelona, London, throughout Africa and the mid-east and of course, New York City. Despite the tragedy and profound sense of losses, we can still hope and seek a silver lining this holiday season by giving from the heart to heal hearts. I have compiled a list of organizations or companies that want to help the greater good by doing good. Please consider their efforts when you are gifting others’ during the holidays or just “any day”. One Hope Wines. Annually this company features worthwhile organizations that deserve our love. Whether to help fight against breast cancer or drive attention about Autism, this company always is about the giving through gifts. Discover their lovely gift bags here that nourish the soul. This year the grape crops of Northern California were nearly obliterated due to numerous fires of unprecedented magnitude. One Hope has pledged to help the farmers and wineries and sent a note from their CEO with their vow for assistance. The statistics are staggering as to how many animals are destroyed annually. That is a polite way to say killed. That’s right – thousands upon thousands of dogs, cats, bunnies, etc. are euthanized because of bad luck. They were throw-aways. 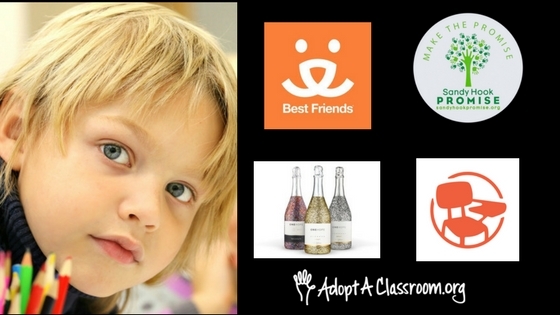 BEST FRIENDS ANIMAL RESCUE works tirelessly to save animal lives and educate humans. Adopt a pet either for “real” or sponsor a pet virtually here. Sponsoring a pet is the perfect gift to give someone who is allergic or unable to care for a furry family member due to living circumstances. Last year I adopted a dog and horse to gift someone! Organizations are abundant to help teachers get the essentials (and occasional perks) funded for their classroom. Don’t believe that school districts in 2017 are flush with money to help our student’s learn. Many have shoes-string budgets and can hardly cover the basics, like textbooks or science equipment. I would love to think that we don’t need a bake sale each time our students need uniforms or basic science equipment. But, that is the reality. Here are some alternate ways to help without having to crack an egg for cookie-dough. Click on the links below to learn more about each organization. Last but not least, one of my favorite charities is the SANDY HOOK PROMISE foundation. They do AMAZING work – year ’round. Their goal – to stop senseless violence, especially from guns, and increase tolerance and compassion in this world. Watch their powerful array of videos here. In closing, please the gift of sharing and caring this holiday season. Imagine the impact your $5, $25 or more donation could have on your community and other communities’ around the world.